Clearance Figure Skating Pants, Tops and Figure Skating Apparel. ChloeNoel PS792 3"Color Waist w/ Pocket Skating Pants -Clearance. These pants are a solid lycra over the heel skating pants with front pockets. Made in the USA. Choose from several colors in Child XXS to Adult XL. For more bling, a AB crystal color block can be added! The Mondor 4730 is a unisex jacket used by many skating clubs. Made of microfiber polar with Teflon protective coating that will repel water and any stain. It will keep you clean, warm and comfortable. Available in child size 6X to Adult XXL. Clearance Mondor 4808 Figure Skating Jacket. This team or training jacket will keep you warm and comfortable in style. Ruched mock neck and cuffs. Thumb loop. Kangaroo style pockets. Available in several colors in child size 6X to Adult XL. ChloeNoel T04 V-Neck Sleeveless Figure Skating Top. Slim and fitted with longer length cover to the mid hip area. Great top for workouts! Available in sizes Child S - Adult L.
Clearance! Mondor 4847 Boys/Mens Supplex Skating Pants The Mondor 4847 figure skating pants will help you move freely on the ice. Removable stirrup to keep pants in place if needed. Available in Boys Size 8 - Adult XLarge. ES Performance Flower Figure Skating Jacket will keep you warm but is lightweight and dries quickly. Made from a polyester/spandex mix with a 4-way stretch, it has thumb holes on the cuffs and a flower pattern on the front and back. Available several colors in Child S - Adult L.
ES Performance Flower Skating Pants - Clearance! Jerry's 827 Mens Razor Sharp Skating Shirt Clearance! ES Performance Flower Skating Pants - Clearance! Made from a quick dry polyester spandex that will keep you warm and dry during skate practice. Choose from several colors in Child Small to Adult Large. Jerry's 827 Mens Razor Sharp Skating Shirt Clearance! A matte black shirt blends well with skating pants but gains impact with a series of slash and slant pieces that sets off one sleeve of royal and white with a hint of shine. Available in Youth Small to Adult Large. 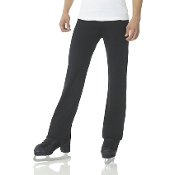 Jerrys 800 Mens Pleat Front Figure Skating Pants Clearance! Made from a heavy weight black matte polyester and feature double pleats, belt loops, and zip fly. Clearance! ChloeNoel JT61 Thumbhole Figure Skating Jacket features the same princess seams as other ChloeNoel jackets, but has added pockets and thumbholes for a unique look. Choose from several colors in Child XXS - Adult XXL. Clearance! ChloeNoel P622F 3" Waist Fleece Skating Pants are made of lightweight fleece. Choose from several designs in Child XXS - Adult XL. ES Performance Sport Figure Skating Jacket. This figure skating jacket will keep you warm but is lightweight and dries quickly. Designed for teams and clubs, it has thumb holes on the cuffs and an open back and chest area for embroideries and team logos. Available Black only in Child S - Adult XL. Clearance! Jerrys Fleece Ribbon Ice Skating Jacket. The hourglass design in complementary accent colors along each sleeve gives a long, slim look. Choose from a variety of colors in Youth S - Adult L. Matches Jerry's Ribbon Fleece Pants. Clearance! Mondor 4750 Figure Skating Jacket. It will keep you warm and comfortable in style. Available in two colors in Child size 6X - Adult L.
Clearance! Mondor 4833 Mens Figure Skating Jacket Ice Fire Fleece Pair of Skates Skating Jacket - Clearance! Clearance! Mondor 4833 Mens Figure Skating Jacket. A great team jacket for boys. Goes well with the matching pants. Soft, comfortable and warm. Tone on tone inserts and thumb loop. Choose from Boys Sizes 4 - 14. Ice Fire Fleece Pair of Skates Skating Jacket - Clearance! Hit the ice in style with this IceFire Fleece Pair of Skates Figure Skating Jacket. Choose from several colors in Child XS - Adult L.
Clearance! Mondor 5380 Fashion Tights. Known in the skating world for the best tights for comfort and durability, Mondor also makes a fabulous fashion tight for girls. Clearance! ChloeNoel J11 Fleece Figure Skating Jacket. This Polar Fleece Fitted Ice Skating Jacket has princess seams and front zipper. Clearance! ChloeNoel P02 Side Stripe Figure Skating Pants. These Sporty Striped Ice Skating Pants help you stay warm during practice. Choose from several colors in Child XS - Adult XL. ChloeNoel P22 Crystal Figure Skating Pants. These 3" Waist Ice Skating Pants are comfortable and warm. Available in Child XXS - Adult XL. Ice Fire Fleece Pair of Skates Skating Jacket - Clearance! Ice Fire Fleece Pair of Skates Skating Jacket - Clearance! Hit the ice in style with this IceFire Fleece Pair of Skates Figure Skating Jacket. Choose from several colors in Child XS - Adult L.